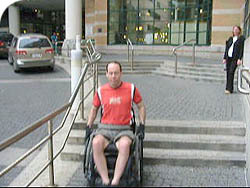 This technique for going down stairs requires you to travel towards the top step at a comfortable speed and then pop the front end of your chair just before you reach the edge, but not into a full wheelie. You only need to pop it as much as you would need to descend a single step. 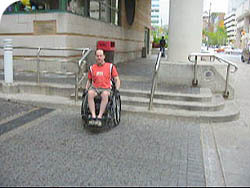 Due to the fact that you cannot make any adjustments to your balance once you’re over the edge (my hands are off the push rims), it can be hazardous if done incorrectly. 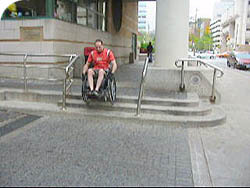 I only recommend it for short flights of one to four stairs, because after that, it becomes very difficult to time the duration of you partial wheelie with the time necessary to make it to the bottom. 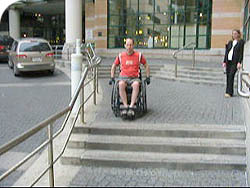 You basically skim along the edges of the steps with your rear wheels. 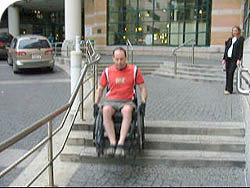 Every time your rear wheels descend a step it prolongs your wheelie. 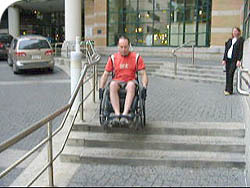 Hence popping your front end for three steps is barely different from doing one step. Start with one step and work your way up to more with practice. 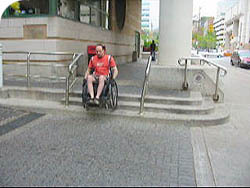 Smaller or shorter steps are better, taller or longer steps will require more speed to skim along them and keep your wheelie. One safety tip is to put a backpack on your chair with something light in it. I.e. clothes, pillow, rolls of paper towels, so you’re less likely to hit the back of your head in the event of a rearward fall. 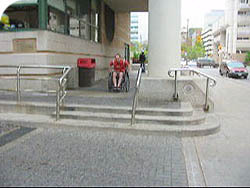 This entry was posted in Wheelchair Tips and tagged stairs, steps, tips, tricks, Wheelchair. Bookmark the permalink.